I’ve been doing a bit of AM operating of late. This vintage mode if fun to operate and sounds great when the band conditions aren’t too noisy. I’ve also been repairing and tinkering with some old transmitters as mentioned in other posts. One of the highest pursuits of the AM op is to achieve great audio. Many will go to great lengths to buy studio rack gear with pre-amps, compressors, limiters, and EQ. Top off all this hamsexy rack gear with a big old boom mic! The other part of the equation is to properly adjust the audio modulation. It’s not as simple as watching the ALC meter like on SSB (although it does help). A first step is to look at the RF waveform on an oscilloscope. You want to verify that the wave isn’t flat topping. A modulation monitor can be used to view the modulation percentage. Combine these two together and you get the AMM-SD1 by Radio Engineering Associates. This slick device connects into the feedline and runs in software on the computer. It’s pretty much real-time display shows the RF waveform and the negative and positive modulation percentage peaks. Seemed like this might be a worthwhile investment for the shack…like I even need an excuse to by cool shack gear! So far it’s confirmed that my AM audio is clean with positive peaks over 120% and negative peaks right at 100%. Right about where it needs to be. I’ve also used it to detect that the Ranger II I’m working on is in need of further inspection. The positive peaks only hit about 40% before the stopping point when negative peaks hit 100%. I never would have found that without the monitor unless trying to make a contact and some OM tells me my signal is crap. This monitor has already proven to be an asset to my radio operation. I just wanted to share it with my followers and encourage people to give AM a try if you like a little more than UR 59 OM, QRZ. There are frequent AM operating events throughout the year, so there’s no excuse not to lay down some carrier and chat it up. I’ve been taking a bit of a break on the Viking II project I mentioned in the last post. Multiple projects always seem to make their way into the shack and cause me distraction. I had an offer come up I couldn’t refuse, and so, had to make room on the bench. My friend Ward K8FD has four Johnson Viking Rangers in his collection. Two are the original model Ranger and the other two are Range II models. He wants to have the best one of each model repaired and keep it for himself. I get to keep the other two for my collection as payment for making all the appropriate repairs. Sounded like a good deal to me. Fortunately, Ward already purchased a couple nice capacitor repair kits and some missing hardware from Nationwide Radio and Equipment Sales. The new parts are quite a bit smaller than the original parts so it wasn’t too much trouble fitting them into the chassis. Several of the old caps were pretty crusty and would certainly would be an issue if they hadn’t already failed. I didn’t want to take any chances so I went straight to making repairs instead of giving an initial test. Along the way, I also tested the tubes and found a couple bad and wrong spec. I was able to do a swap-a-roo since there were four transmitters in the shack! Repairs have been pretty straight forward so far. Considering it didn’t work at all when I started, making even a little power is success. Power output stays around 25-30 watts AM and CW. I’ve found it to be pretty easy to tune up compared to other tube rigs I’ve tried. It also seems to be pretty forgiving and tolerant of my slow tune-up, which is nice…I have smoked components before from persistent mis-tuned conditions. This is actually a 160-6m transmitter which is kinda cool for such an old rig. I suspect most people really only operate them on 80 and 40m if running AM. Maybe other bands on CW I suppose. 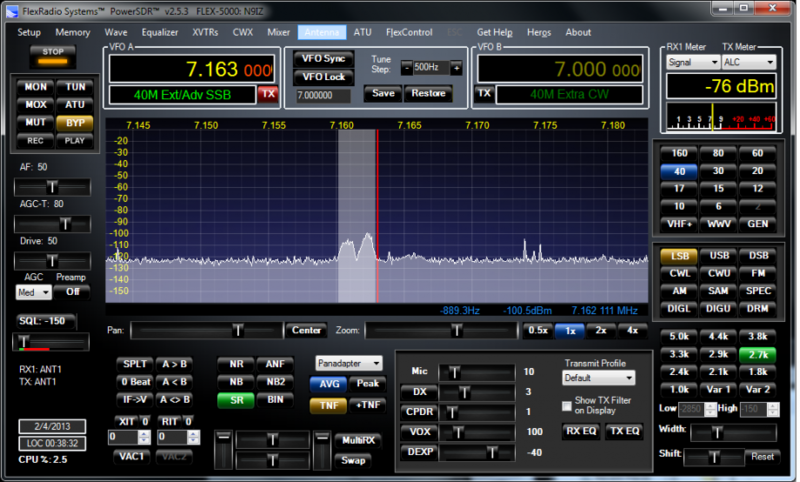 The dial reads within about 12 kHz which isn’t too bad. Looking forward to installing it back into the cabinet and giving it a try on the air.